Matching paint colours for cars is a highly specialised area. Fortunately, we have 35 years of experience in this area. We always maintain up-to-date records of paint codes supplied by manufacturers. We can help you find the right colour for the project you are painting. We supply all the right paints and materials to finish your project. 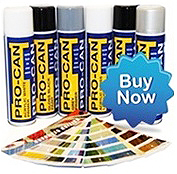 Our specialist aerosol product PRO-CAN can provide you with any paint in any colour in a can. We do not limit the supply of paints and primers for vehicle refinishing to just aerosols. We can also supply loose paint for use in your own spray guns for example. Whatever your needs, call us on 0115 963 1451 and we will tell you how we can help you. Call us on 0115 963 1451 or use the contact form today and tell us about your project and we will tell you how we can help you.